Manchester Friends of the Earth | Why Pulses in 2016? Pulses have a positive impact on soil quality because they help fix nitrogen in the soil. This contributes to higher yields in subsequent crop rotations. However it is not the only reason. Pulses have a direct positive impact on soil quality because they help feed soil microbes, which benefits soil health. Pulses have also been shown to produce greater amounts and different types of amino acids than non-legumes and the plant residues left after harvesting pulse crops have a different bio-chemical composition than other crop residues. It is this diversity in soil composition that comes from a good pulse rotation, which help crops to thrive and which offers greater protection against disease-causing bacteria and fungi. Pulses are also a protein source with a low footprint, in both carbon and water. For instance, the water footprints to produce a kilogram of beef, pork, chicken and soybeans are 43, 18, 11 and 5 times higher than the water footprint of pulses. Pulses have a lower carbon footprint in production than most animal sources of protein. In fact, one study showed that one kilogram of legume only emits 0.5kg in Co2 equivalent, whereas 1kg of beef produces 9.5 kg in CO2 equivalent. The very low contribution of legumes is well illustrated in the graph below. 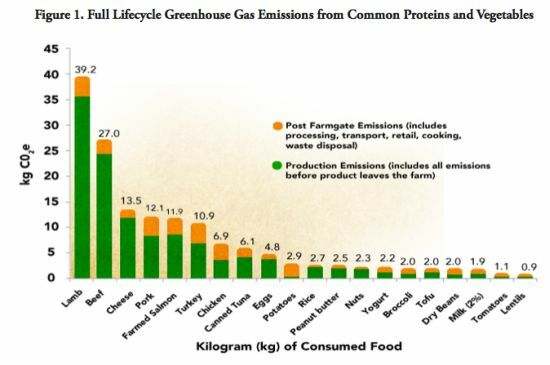 Full lifecycle greenhouse gas emissions frm common proteins and vegetables. It shows that lentils are one of the foodstuffs that contributes the least emissions, far fewer than turkey, salmon or other common sources of protein. Pulses are part of a healthy, balanced diet and have been shown to have an important role in preventing illnesses such as cancer, diabetes and heart disease. Pulses are a low fat source of protein, with a high fibre content and low glycemic index. Pulses are very high in fibre, containing both soluble and insoluble fibres. Soluble fibre helps to decrease blood cholesterol levels and control blood sugar levels, and insoluble fibre helps with digestion and regularity. Pulses provide important amounts of vitamins and mineral. Some of the key minerals in pulses include: iron, potassium, magnesium and zinc. Pulses are also particularly abundant in B vitamins; including folate, thiamin and niacin. Pulses typically contain about twice the amount of protein found in whole grain cereals like wheat, oats, barley and rice, and in most developing countries constitute the main source of protein for most populations.